I needed to spread these lovelies out and lay them in their proper order…always makes me happy! We should all do this when it rains…lay out our colour pencils in lovely arrays of colours! Hand picked set of Polychromos pencils (Faber Castell). First thing I do when I get new supplies is make a colour chart. Partly just to have an excuse to fondle my new pretties, partly because colour charts make me happy and partly because it’s simply a chore an artist needs to do: thorough research…getting thoroughly acquainted with one’s tools, right? 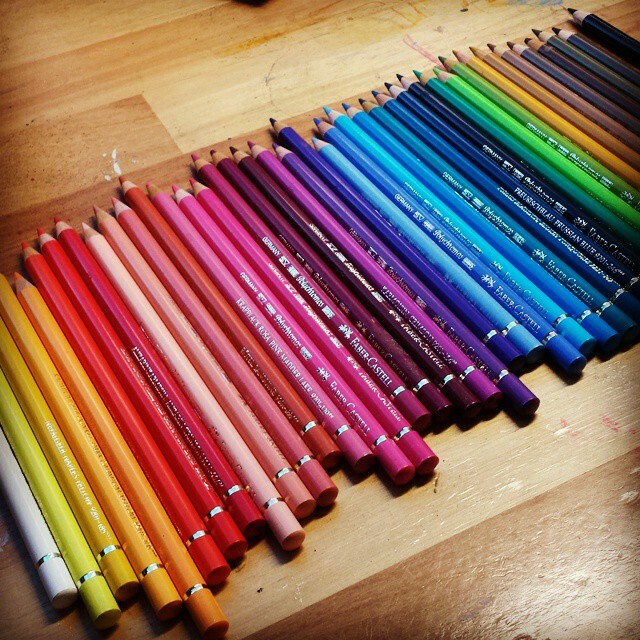 It’s so tempting to buy a huge box of pencils…to have ALL colours. But that’s what I did a few times in the past. How they ended up? Catching dust in my storage space. I simply picked out a dozen of pencils and the rest just lay there…and still lies there. In practice we don’t use ALL colours. Or do you? 120 pencils is awesome to have…to show off in a special cabinet or something. But to use? Nehhh….simple box and a few dozen of favorites…more economic (leaves cash for extras as you can see in the top photo 😉 ), saves space and keeps you free from a sense of guilt which leaves all the more room for inspiration! But okay, done preaching now! Speaking of which…tomorrow’s Sunday! Looking forward to it…’cause I have my pens ready, my pencils, my watercolours and my new gouache! Can’t wait to get started!! !